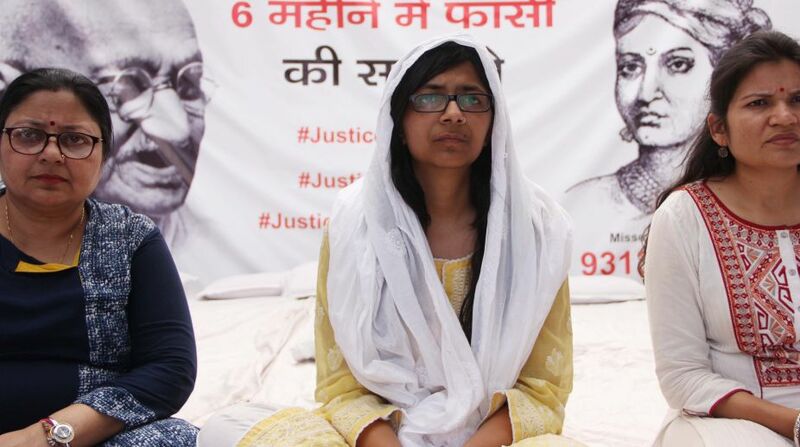 Demanding stringent laws and the death penalty for rapists, Delhi Commission for Women (DCW) chief Swati Maliwal continued her indefinite hunger strike for the fourth day on Monday. “Instead of taking some action and responding to our demands, the Centre is trying to end our hunger strike. If the government can ban currency notes overnight why can’t the Prime Minister take some strict measures ensuring safety for women,” the DCW chief said. “Arvind Kejriwal sir, the DCP, the ACP and the doctor are harassing me. My ketone level is 2. As you may appreciate, this is nothing. Even yesterday, they fabricated reports. I am at Rajghat and the entire police force is forcibly trying to take me away. Sir, I request you to ensure my protection from them,” she tweeted.